“I’ve always treated women with dignity and respect,” Supreme Court nominee Brett Kavanaugh told Fox News’s Martha MacCallum on Monday night. It was a phrase Kavanaugh used roughly four times in the friendly interview; a chorus which Kavanaugh, accompanied by his wife Ashley, repeated with flat insistence. On the Ford allegations, Kavanaugh reiterated much of what we have already heard. He insisted that he was not at the 1982 party where Ford alleges the sexual assault took place. He added that while he “may have met” Ford, they did not “travel in the same social circle, she was not a friend, not someone I knew.” In a likely preview of the hearings that will take place later this week, Kavanaugh drew attention to “Dr. Ford’s lifelong friend”—Leland Ingham Keyser (neither MacCallum nor Kavanaugh used her name). “Dr. Ford’s lifelong friend has said she doesn’t know me and never remembers being at a party with me at any time in her life,” Kavanaugh said. “No one has corroborated the story that [Ford] has told, as you accurately point out,” MacCallum began the followup question. Neither bothered to mention that though Keyser does not remember the party, she emphasized in a call with the Washington Post that she believes Ford. And yet, in his call for fairness and his insistence on his fine character, Kavanaugh again seemed uninterested in the details of his own case. (This lack of curiosity is a common enough condition.) “Are you surprised that the New Yorker published this account?” MacCallum asked. “I’m not going to comment on the New Yorker’s journalistic practices,” Kavanaugh responded. “The New York Times said they could not corroborate this story and said that the person making the accusation had been calling around last week to other classmates, indicating her uncertainty about whether I had ever done such a thing.” Both Jane Mayer and Ronan Farrow characterized the claim that the Times declined to publish as inaccurate. Kavanaugh continued: “What I know is I’ve always treated women with dignity and respect. Listen to the women who’ve known me my whole life. A letter from friends I knew in high school, produced overnight, 65 women who knew me in high school, women I knew in college who said how I much I support their women athletics.” Shortly after Kavanaugh’s interview with Fox concluded, the New York Times reported that one of the women who signed the letter, Renate Schroeder Dolphin, was named on his yearbook page, part of a group of football players’ “unsubstantiated boasting about their conquests,” the Times gently put it. 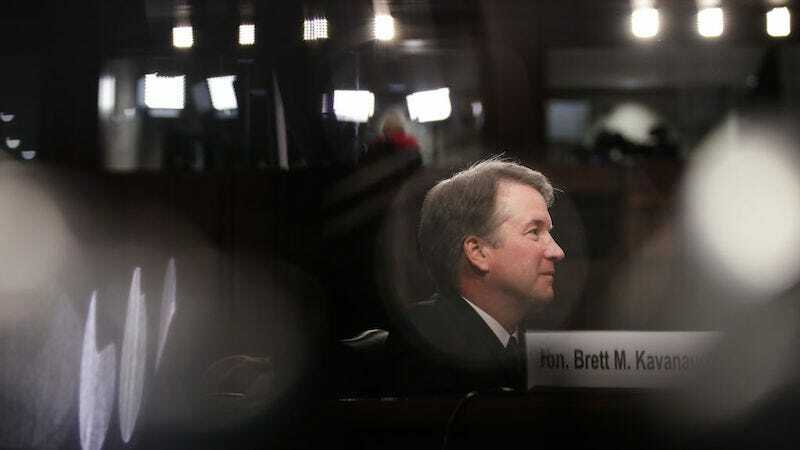 If Monday’s interview was a preview of the hearings scheduled for Thursday, then the coming days will likely be a referendum on character, particularly on the concepts of the “decent man” or the “good man.” They are phrases—like “respect for women”—that are so obviously hollow yet retain a nostalgic, rhetorical cache. It is important to be a decent man; it is equally important, the line of argument goes, that a decent man is not “smeared.” It’s clear that Kavanaugh and his supporters truly believe in these phrases and the importance they signify; it’s telling too that as sexual assault allegations carry new weight, that there has been a deep reinvestment in preserving the very concept of the “decent man” even as it’s increasingly rendered more and more meaningless.